This is an interesting one. 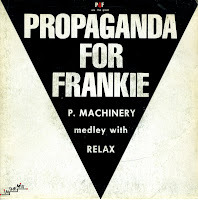 Propaganda for Frankie is an Italian producer/DJ outfit that decided to profit from the ongoing popularity of the bands Propaganda and Frankie goes to Hollywood. Their track 'P-machinery medley with Relax' is what people would nowadays call a 'mashup'. The difference being that the songs are performed by other, unnamed, artists. Although the concept is the same as Club House's 'Do it again with Billie Jean', this single didn't become a Europe-wide hit. Instead, it has become some sort of item for Italo House afficionados.